To view all our latest news from 2018 please visit our Facebook page thank you. ‘Beili Blues’ Blue Texel sheep will be for sale this year at a special one-off sale held at Borderway Market, Carlisle on 30th August 2013. We are joining the well-known ‘Millside’ Blue Texel flock for a joint production sale of approx 80 females and 20 males. Amongst the sheep for sale by ‘Beili Blues’ will be the prize winners from the RWAS 2012 and also progeny from the Female Champion at the RWAS 2010. Pictures of these show winners can be seen in our galleries. If you have any questions, please feel free to contact me or for more information regarding the ‘Millside’ flock of Blue Texels, please visit www.millsidefarm.co.uk. ‘Beili Blues’ represented the Blue Texel Sheep Society at the NSA Welsh Sheep 2013 held at Beili Ficer Farm, Llansawel on Tuesday 21st May. There was an excellent turnout at the event and with a brand new display stand attracting attention, there was great interest in the Blue Texel sheep. On display on the day were 2 yearling rams, 2 yearling ewes, a Blue Texel ewe with her 2013 born ewe lamb and a Suffolk X ewe with her twin lambs sired by a Blue Texel ram. Worcester Society Sale – An excellent show and sale for ‘Beili Blues’. We achieved 1st prize with a homebred yearling ewe. 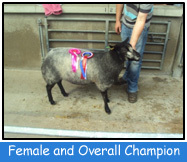 She went on to be female and overall champion on the day. Three yearling ewes averaged 900gns in the auction with our champion ewe selling for 1400gns to Mr Rhys Cooke, ‘Nantyderri’ flock. We also achieved reserve male champion with a homebred yearling ram. Three ram lambs sired by our dutch stock rams sold for an average of 480gns. A very productive day! Builth Wells - NSA Ram Sale – At the show, 2nd prize was secured for one of our homebred yearling ewes and 4th prize for one of our ram lambs. Our ram lambs, all of which had Dutch bloodlines in their pedigrees, went on to sell for excellent prices at the auction with 4 lambs securing an average of 541gns. The top price ram lamb sold for 710gns to Mr S Cowin & Miss C Coates, ‘Pennine View’ flock. 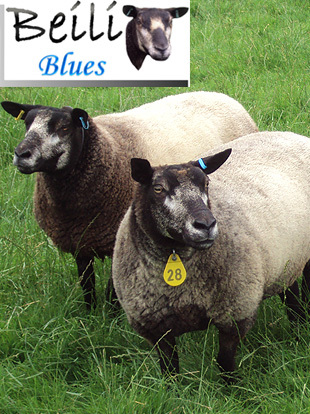 Carlisle Society Sale – Another successful show and sale for the ‘Beili Blues’ where we won reserve male with a ram lamb and reserve female with an ewe lamb. 4th prize was also secured by our yearling ram and 3rd and 4th prizes in the yearling ewe class which sold for 900gns and 850gns respectively. Three ram lambs sold well, with a top price of 650gns for the reserve male champion and our reserve female champion ewe lamb, with imported Dutch blood on both sides of her pedigree, sold for 1100gns. 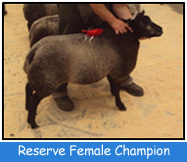 She was purchased by Cormack Dowell Partners, Eastriggs, Dumfriesshire for their CJ’s flock. November 2012:- An excellent turnout for the Blue Texel AGM as over 70 people visited the ‘Beili Blues’ flock. We would like to thank everyone for making the journey to West Wales, some travelling a great distance. We hope everyone enjoyed the day. July 2012:- In blazing sunshine, ‘Beili Blues’ had a very successful Royal Welsh Show, where the Blue Texel sheep entries were higher than ever and the standard was excellent. Rams (any age):- 3rd prize won by one of our stock rams - ‘Bishop’. Ewes (any age):- 5th prize by a home bred yearling ewe sired by our stock ram ‘Huw’. Ram Lambs:- 2nd & 3rd prizes achieved in a class of over 20 lambs. Both lambs sired by our stock ram ‘Bouman’s’. The 2nd prize lamb went on to win Reserve Male Champion. 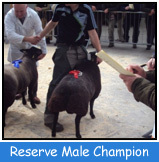 The Champion Male was a ram lamb bred by Mr & Mrs A. Thomas, sired by a ‘Beili Blues’ ram which they had purchased in 2011. Ewe Lambs:- 1st and 2nd prizes were secured in a class of over 20 ewe lambs. This was a huge achievement for the ‘Beili Blues’ flock. They were sired by ‘Bouman’s’ and ‘Boelstra’ respectively. The 1st prize ewe lamb went on to win Reserve Female Champion and Reserve Overall Breed Champion. A fantastic end to a very successful day in the ‘Beili Blues’ calendar. Blue Texel Society AGM will be held on the 10th November, 2012 starting with a flock visit at ours at 11am. This will be followed by a second flock visit to the nearby Turbo Blues flock, a recently established flock of imported Blue Texels; we will then go on for a meal and meeting at the nearby Grannell Hotel, Llanwnnen. All welcome! !